FORT MYERS, Fla. (January 4, 2017) - The Fort Myers Miracle, in conjunction with the Minnesota Twins, are pleased to announce that 12-year MLB veteran, former Miracle player and manager Doug Mientkiewicz will return as the field manager for the 2017 season. Mientkiewicz, 41, begins his second stint in Fort Myers after spending the last two seasons in Double-A with the Chattanooga Lookouts. Beginning his managerial career with the Miracle in 2013, Mientkiewicz won his first 14 games of the season, led the Miracle to the best record in the Florida State League at 79-56 and a FSL South Division first half championship with a 45-22 record. The first half winning percentage of .672 in 2013 was the best in team history and the 45 wins matched the most in a half. 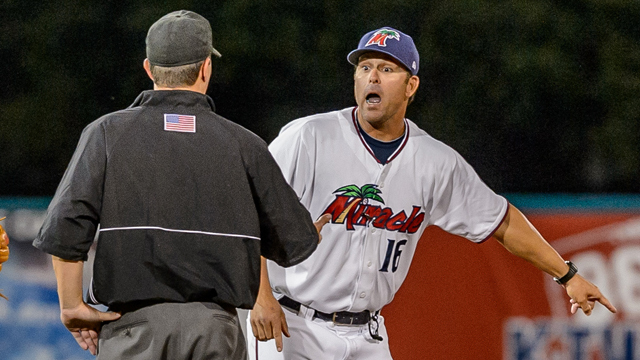 After being named the FSL Manager of the Year in 2013, Mientkiewicz led the Miracle to a first-ever FSL Championship in 2014. The Miracle posted 41 wins to claim a first half championship and then totaled 41 more victories in the second half. Fort Myers finished at 82-57 with the 82 wins marking the second-most in team history. In the FSL Playoffs, Mientkiewicz guided the Miracle to a two-game sweep of Bradenton to earn the FSL South Division crown. The Miracle followed with a defeat of Daytona, then a Cubs affiliate, in four games for the championship. Mientkiewicz owns a 161-113 record as a manager in the Florida State League. After winning the FSL Championship with the Miracle, Mientkiewicz moved up to Chattanooga and guided the Lookouts to the 2015 Southern League Championship with a 76-61 overall record and a 6-3 showing in the postseason. In four seasons as a manager in the Twins organization, Mientkiewicz has a 312-239 mark with a .566 winning percentage. Prior to the start of his managerial career, Mientkiewicz was with the Los Angeles Dodgers organization where he was the hitting coach for the Ogden Raptors of the Pioneer League in 2012. Mientkiewicz played in 1,087 games in the Major Leagues from 1998-2009 with the Minnesota Twins, Boston Red Sox, New York Mets, Kansas City Royals, New York Yankees, Pittsburgh Pirates and Los Angeles Dodgers. Mientkiewicz was drafted by Minnesota in the fifth round of the 1995 Major League Baseball Draft and debuted with the Miracle in 1995. Mientkiewicz played two seasons with the Miracle appearing in 171 games in 1995 and 1996. The Fort Myers Miracle are the Class A Advanced minor league baseball affiliate of the Minnesota Twins Major League Baseball Club. Since moving to Fort Myers in 1992, the Miracle have qualified for the Florida State League Playoffs eight times and won the Florida State League Championship in 2014. Home games are played at Hammond Stadium at the CenturyLink Sports Complex. The Miracle season begins in April and ends in September with Opening Day of the 2017 season set for Saturday, April 8 at 6:05 p.m. For a game and events schedule, or more information, visit www.miraclebaseball.com.